"His Excellency Daniel Mulhall, Ambassador of Ireland to the United States, will speak as part of the University of Virginia Center for Politics' Ambassador Series in the Rotunda Dome Room on April 2 from 3:30-4:45 p.m. Ambassador Mulhall will address the relationship between Ireland and the United States with emphasis on the countries' Declarations of Independence for which Ireland celebrates its 100th anniversary in 2019." While I'll be in Washington, D.C., that day, I very much hope someone will take the time to videotape themselves asking His Excellency how Ireland can be considered independent when the U.S. military uses Ireland's airports to fight U.S. wars, in gross violation of Ireland's legal commitment to neutrality and against the will of the people of Ireland. "We Serve Neither King nor Kaiser, But Ireland," it said 100 years ago on the facade of Liberty Hall in Dublin as the Irish successfully refused to be drafted into a British war. "We Welcome Neither President Nor Imperial Buffoon," might be a good new banner for an Ireland that has thus far been spared the embarrassment of a visit from His Idiocy Donald Trump. But the last time an Irish Ambassador, Anne Anderson, spoke at the University of Virginia, two years ago, she effectively told me that Ireland would bow to Trump's wishes. I asked her this: "Since the U.S. government assures the Irish government that all U.S. military aircraft being refueled at Shannon are not on military operations and are not carrying weapons or munitions, and since the Irish government insists on this in order to comply with Ireland's traditional policy of neutrality, why does the Irish department of transportation almost daily approve civilian aircraft on contract to the U.S. military to carry armed U.S. troops on military operations, weapons, and munitions through Shannon Airport in clear breach of international laws on neutrality?" Ambassador Anderson replied that the U.S. government at the "highest levels" had informed Ireland that it was in compliance with the law, and Ireland accepted that. So, the highest level of the U.S. government says that black is white, and Ireland says "Whatever you say, master." I'm sorry, my Irish friends, but with all due respect, my dog has a better relationship with me than you have with the United States. On March 17, 2019, two of my friends were arrested in Ireland. Tarak Kauff and Ken Mayers are peace activists, members of Veterans For Peace, and veterans of the U.S. military. They participated in a protest rally at Shannon Airport. Then they entered the air field in order to inspect one of the U.S. airplanes on its way to a U.S. war. They were thrown into the jail in Limerick, denied bail, and threated with two-years imprisonment pre-trial. Will Ambassador Mulhall use the following words in his speech at UVA: "freedom"? "liberty"? "human rights"? Will he claim that those who won what independence Ireland has and what rights Catholics in Ireland have did so without violating any petty laws? Will he defend long-term lawless imprisonment as an indication of advanced civilization? Under Hague Convention V in force since 1910, and to which the United States has been a party from the start, and which under Article VI of the U.S. Constitution is part of the supreme law of the United States, "Belligerents are forbidden to move troops or convoys of either munitions of war or supplies across the territory of a neutral Power." Under the United Nations Convention Against Torture, to which both the United States and Ireland are parties, and which has been incorporated into very selectively enforced felonies in the U.S. Code since before George W. Bush left Texas for Washington, D.C., any complicity in torture must be investigated and prosecuted. Under both the U.N. Charter and the Kellogg-Briand Pact, to both of which the United States and Ireland have been parties since their creation, the war in Afghanistan and all the other U.S. wars since 2001 have been illegal. The people of Ireland have a strong tradition of resisting imperialism, dating back even before the 1916 revolution, and they aspire to representative or democratic government. 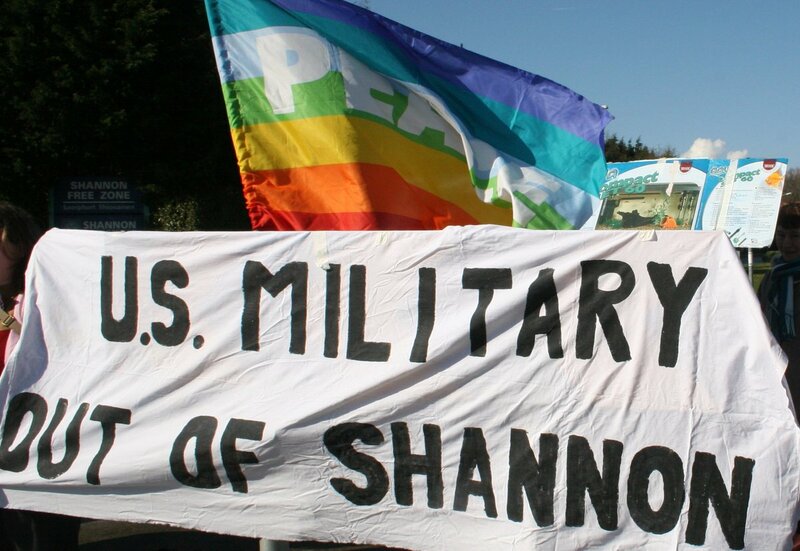 In a 2007 poll, by 58% to 19% they opposed allowing the U.S. military to use Shannon Airport. In a 2013 poll, over 75% supported neutrality. In 2011, a new government of Ireland announced that it would support neutrality, but it did not. Instead it continued to allow the U.S. military to keep planes and personnel at Shannon Airport, and to bring troops and weapons through on a regular basis. 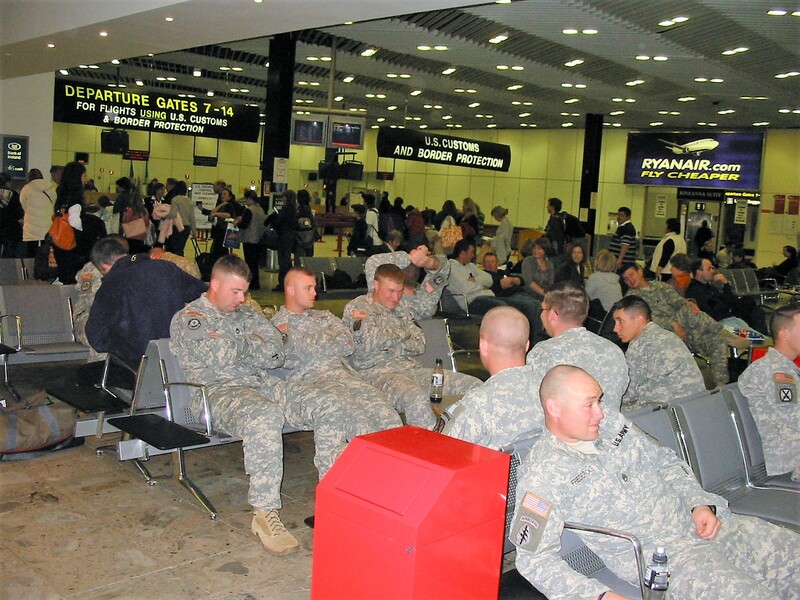 The United States military has no need for Shannon Airport. Its planes could reach other destinations without running out of fuel. One of the purposes of regularly using Shannon Airport, perhaps the main purpose, is very likely simply to keep Ireland within the coalition of the killing. On U.S. television, announcers thank "the troops" for watching this or that major sporting event from 175 countries. The U.S. military and its profiteers ought to hardly notice if that number dropped to 174, except that their goal, perhaps their main purpose and driving objective, is to increase that number to 200. Hey, you Irish rabble, Trump knows better than you, so stay out of the way!